Robbie Neilson wants his Hearts team to play better football despite moving up to second place in the Premiership. 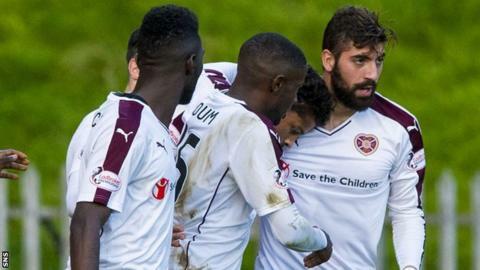 A clinical 4-0 win over Partick Thistle was enough to move Hearts above Aberdeen, with Juanma and Osman Sow both scoring doubles at Firhill. Neilson felt the performance against 10-man Partick could have been more polished. "The result is great, but the performance isn't where we want to be," Neilson told BBC Scotland. "It was a good performance in the second-half, but I thought in the first half we were pretty poor and I was disappointed with that. "I know we came in at 1-0 up, but it wasn't very exciting, the passing wasn't as good as it should have been. To come away from home and get a 4-0 win is great, but I want to make sure we play better football at times." The Hearts head coach will not revise his target for the season, insisting it remains to finish in the top six. "It's nice to be second but there's still a long way to go," he said. "Top six has always been the target and that's what we're looking at. "The closer we can stay to second place, the more chance we have of finishing top six, so we won't get carried away. "We had a good run at the start of the season then fell away a bit but we've managed to pick it up again. We can't get carried away." His counterpart Alan Archibald described the home side as "shocking and disappointing". Partick Thistle were lively and composed in the first-half, but lacked a cutting edge up front. The game was evenly poised even after Hearts opened the scoring through Juanma in the dirt-half, but Hearts were as ruthless as Partick Thistle were meek after the interval. Juanma scored again from the spot, in between Sow strikes, the second of which also came from a penalty, after Thistle goalkeeper Ryan Scully was sent off for bringing Sow down inside the area. "The first-half was fairly even, we were well in the game and we had a couple of chances," said Archibald. "I thought we went to pieces when they got their second goal, our shape went and that isn't acceptable. There were enough experienced boys out there to keep it tight, because we're still in the game at 2-0. "[I'm] very angry with the manner of the second-half, that just isn't acceptable. We downed tools, that's the way it felt and I'm sure it looked that way to the fans. "We went into the game with confidence and thought we could hurt them. We didn't see that coming in the second half, we're shocked and disappointed by it."